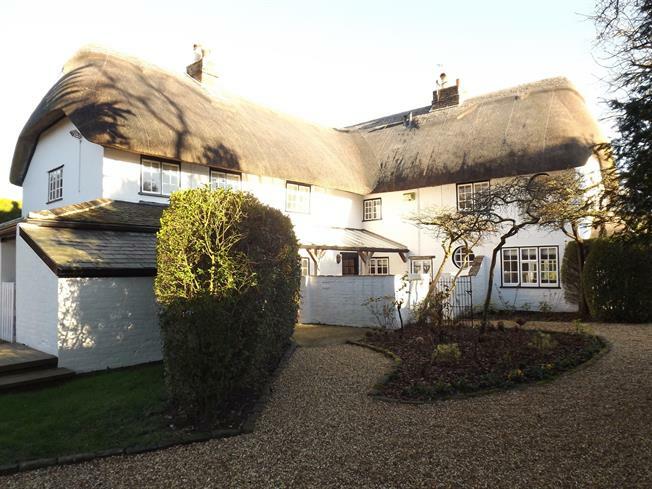 4 Bedroom Detached Cottage For Sale in Christchurch for Offers in excess of £1,000,000. This Grade II listed property has just had a bespoke interior design and is truly stunning. The designer has brought the property into the modern day with clever use of colours and materials including beautiful chandeliers. It was built around 300 years ago and several famous families have lived here over the centuries including the poet laureate Robert Southey who penned a poem about a little girl and three bears - "Goldilocks and the Three Bears" - the inspiration coming from Burton Cottage. There are four individually designed double bedrooms including a fabulous triple aspect master bedroom with views over the gardens, a magnificent en-suite and dressing area, a second dressing room with impressive walk-in wardrobe, a family bathroom, spacious landing with original exposed beams, charming entrance, a spacious study, a triple aspect lounge with fireplace and wood burner, large dining room with fireplace, family room with projector and screen, "Chippendale" bespoke fitted kitchen plus breakfast room, utility room, two ground floor cloakrooms, gas central heating, outbuildings including wood store, loggia and oversized garage. The gardens are secluded on all sides and there is a great South and West facing decking area, a separate patio and courtyard providing an ideal sun trap and haven. Wooden panelled front door with courtesy light. Side aspect window. Wooden window with obscure glass. Radiator, shelving, part tiled walls, painted plaster and vaulted ceiling. Concealed cistern WC, pedestal sink. A charming double aspect room with wooden framed windows facing the front and side overlooking the garden. Radiator, under stair storage cupboard with shelving, painted plaster ceiling, wall lights. Into recess. Another charming room with triple aspect wooden windows facing the front, side and rear overlooking the gardens. Fireplace with wood burner, radiators, painted plaster and beamed ceiling, downlights and wall lights. Double aspect wooden windows facing the front and side overlooking the garden. Radiator, solid oak flooring, painted plaster and beam ceiling, downlights and wall lights. Double aspect with wooden windows facing the rear and side overlooking the courtyard and garden. Fitted screen and projector. Radiator, solid oak flooring, painted plaster ceiling, wall lights. A hand built "Chippendale" fitted wood kitchen with granite work tops. Side door opening onto the patio. Wooden window facing the side overlooking the garden. Radiator, slate flooring, part tiled walls, painted plaster ceiling, downlights and feature lighting. Range of hand built wall, base, display and drawer units, butler style sink with mixer tap and drainer, integrated electric oven and microwave oven, integrated electric induction hob, over hob extractor, integrated dishwasher. Wooden window facing the rear overlooking the courtyard. Radiator, slate flooring, beam ceiling, wall lights. Two wooden windows, side aspect. Radiator, slate flooring, boiler, tiled walls, painted plaster ceiling. Granite effect work surface, fitted hand built wall, base and drawer units, butler style sink with mixer tap, space for washing machine, dryer and freezer. Wooden back door opening onto decking area. Solid oak flooring, painted plaster and vaulted ceiling, feature light. Wooden window. Radiator, solid oak flooring, painted plaster ceiling, spotlights. Low level WC, pedestal sink. Much character with exposed beams. Two wooden windows overlooking the gardens to the front and rear. Radiator, large airing cupboard, painted plaster ceiling, feature light. A delightful triple aspect room with wooden casement windows facing the front, side and rear overlooking the gardens. Window seating, radiators, range of fitted bedroom furniture, painted plaster ceiling, downlights and feature light. With delightful hand painted landscapes. Fitted wardrobes, wooden casement window. Radiator, part tiled walls, painted plaster ceiling, downlights. Concealed cistern WC, double ended bath with mixer tap and shower over bath, single enclosure shower, vanity unit with inset sink with mixer tap. Another delightful triple aspect room with wooden casement windows overlooking the gardens, two radiators. Double aspect with wooden casements overlooking the gardens, radiator. Wooden casement window overlooking the garden, radiator, fitted wardrobe, fitted study area. Walk in wardrobe and store room with hanging rails. Wood casement window. Radiator, tiled flooring, part tiled walls, painted plaster ceiling, downlights. Low level WC, double ended bath, shower over bath, pedestal sink, bidet. The property is approached along a gravel driveway which leads to the garage and opens up to provide lots of space for a number of vehicles and there is plenty of space for boats etc. With remote control up and over door, power and light and side door. These are a particular feature of the property with the plot approaching three quarters of an acre and gardens on all sides. Mature hedging and trees give excellent seclusion. There are different compartments to the garden with extensive lawns, an enclosed courtyard area and a large decking area and most of the garden faces a southerly aspect. A 25' covered area opening onto the courtyard with gate leading through a a second Loggia opening onto the decking area with brick flooring and vaulted ceiling. A brick store room plus a second open sided storage area.